(A) Representative Western blot of XLCNM patient muscle lysates for DNM2, MTM1, and GAPDH loading control. (B) Relative level of DNM2 protein expression determined by densitometry, standardized to GAPDH. n = 5 patients. TA (C) and diaphragm (E) skeletal muscle lysates from 5-week-old WT and Mtm1–/y mice were immunoblotted for DNM2 and GAPDH. 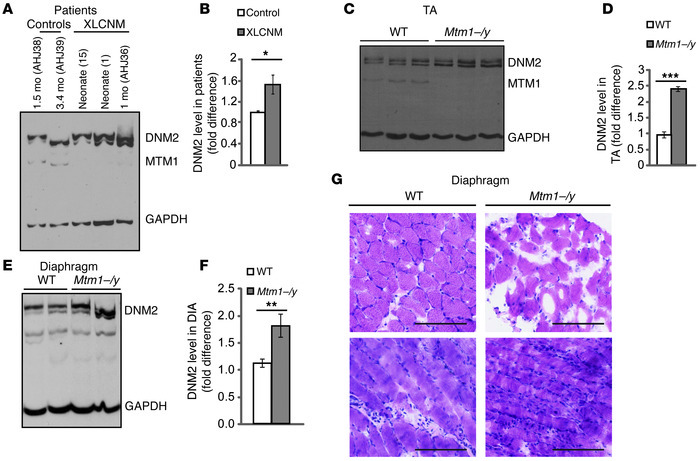 Relative levels of DNM2 protein determined by densitometry of DNM2 immunoreactive polypeptides, standardized to GAPDH, for TA (D) and diaphragm (F). DNM2 expression is represented as fold difference from WT lysate. n = 4 mice. (G) Diaphragm muscle sections stained for H&E. Scale bars: 100 μm. All graphs depict mean ± SEM. *P < 0.05; **P < 0.01; ***P < 0.001.